Recurring contributions = more money. Period. That’s because donors can chip in a small amount each month, rather than making a large, upfront contribution. Since you can see how many months your recurring contributions typically last, you’ll have a good sense of what the next cycle of fundraising will look like at your organization, allowing you to make better monthly budgeting decisions. If you have a small staff, recurring contributions allow you to spend less time on fundraising each month, which means you can spend more time on campaigning and programming. Need more proof? 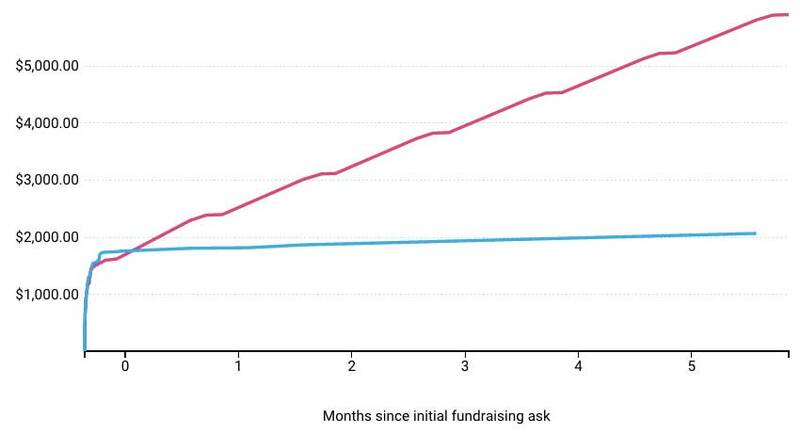 The chart below shows an example of the difference between funds from a recurring ask and a one-time ask. The blue line represents a one-time ask and the pink line represents a recurring ask. After the initial send the one-time ask brought in $1,770 and the recurring ask brought in $1,635 — not much of a difference at first. But, five months later the one-time ask is up to $2,070 while the recurring one has brought in $5,900. This example illustrates how building a pool of recurring donors can pay-off in the long-term. We’ll take care of processing donations every month until your donors’ pledges run out. If they have questions, we’re ready to answer them. Once your recurring program is in place we provide you with the tools to evaluate your program. We offer a weekly recurring option that can be turned on eight weeks out from an election or leading up to your organization's big day of action, allowing you to continue cultivating those strong connections with your supporters throughout your final push. You can contact us to get more information about the weekly recurring feature at support@actblue.com.